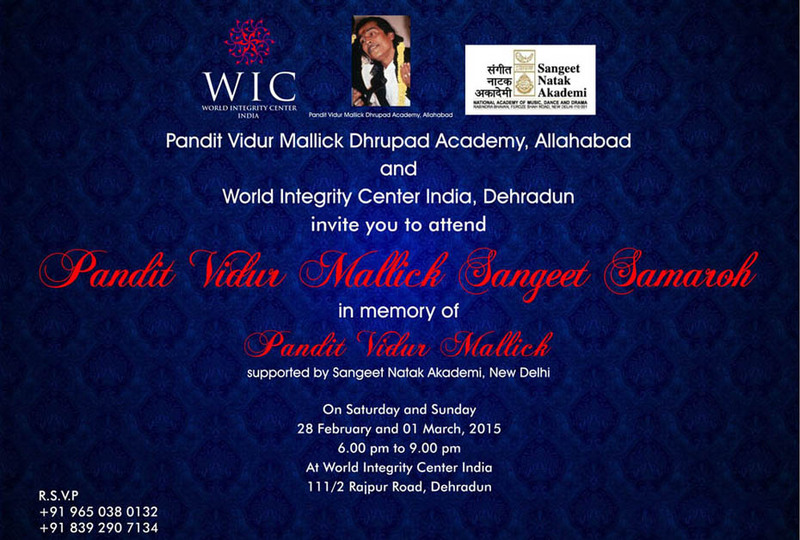 Pandit Vidur Mallick Dhrupad Academy was founded and registered by Sh. Prashant & Nishant Mallick (Mallick Brothers) in May, 2011 in the fond memory of Dhrupad legend Pandit Vidur Mallick. This Academy is for those who are fully devoted to music and want to learn Ancient Classical music of India - Dhrupad Vocal and others classical vocal forms like Khayal, semi-classical music. The Academy welcomes students who want to become professional musicians and aim to devote their life into music as Professionals. Pandit Vidur Mallick Dhrupad Academy is situated in the holy city of Hinduism known as Allahabad. The ancient name of the city is Prayaga ("place of sacrifice"), as it is believed to be the spot where lord Brahma offered his first sacrifice after creating the world. It is one of the four sites of the mass Hindu pilgrimage Kumbh Mela, the others being Haridwar, Ujjain and Nashik. It has a position of importance in Hindu scriptures for it is situated at Triveni Sangam, the confluence of the holy rivers Ganges and Yamuna, and the ancient Sarasvati River. The Academy has been started with an objective to promote and educate Dhrupad music to the committed students of music and to produce future upcoming artists on the National & International level. A four-year structural music training course is designed for Dhrupad vocal aspirants. Apart from the basic traditional training, those who want to come to learn music for a short term courses such as 15 days, 3 months or 6 months are also given admission to the Academy. Pandit Vidur Mallick Dhrupad Academy also organizes two National leval music festivals annually for the promotion, propagation and sustainment of Dhrupad music in various part of the Country. India’s top-notch musicians have given their performances in these festivals including Padmabhushan Pt. Vishwa Mohan Bhatt, Padmashree Ustad Wasifuddin Dagar, Padmashree Gundecha Brothers, Pt. Abhay Narayan Mallick, Pt. Pushpraj Koshti, Pt. Ritwik Sanyal, Pt. Falguni Mitra, Pt. Naresh Malhotra, Pt. Anil Chaudhary, Pt. Ravishankar Upadhyay, Pt. Sukhdev Chaturvedi, Pt. Salil Bhatt to name a few. 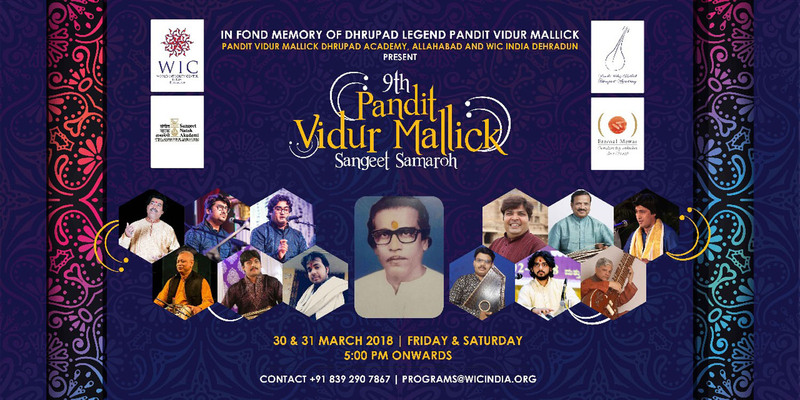 Pandit Vidur Mallick’s musical legacy is been carried on with his son Pandit Prem Kumar Mallick, the senior musician of this tradition as well as his grandsons Sh. Prashant & Nishant Mallick, grand-daughter Smt. Priyanka Mallick Pandey and other family members and huge number of disciples. Pt. Prem Kumar Mallick along with the Sh. Prashant-Nishant Mallick are imparting vocal music training at the Academy apart from few more eminent Gurus. Students who are from foreign countries aloso visit the Academy for music classes on tourist/students visa for learning music at the academy. Necessary arrangements for lodging and boarding are also being provided by the Academy. 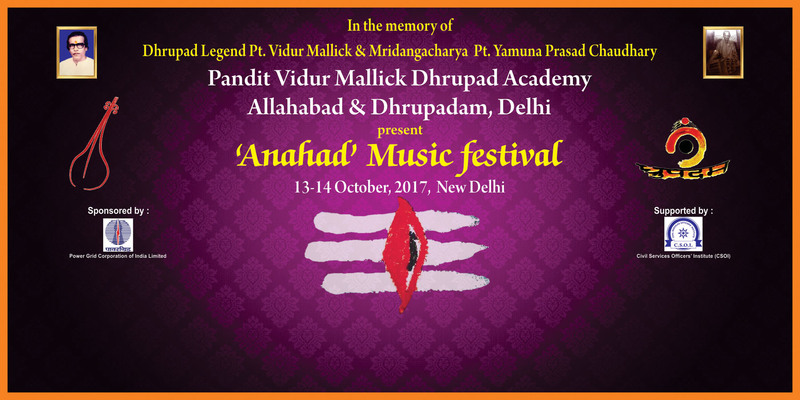 ANAHAD Music Festival In the Memory of Dhrupad Legend Pt.Vidur Mallick & Mridangacharya Pt. Yamuna Prasad Chaudhary. 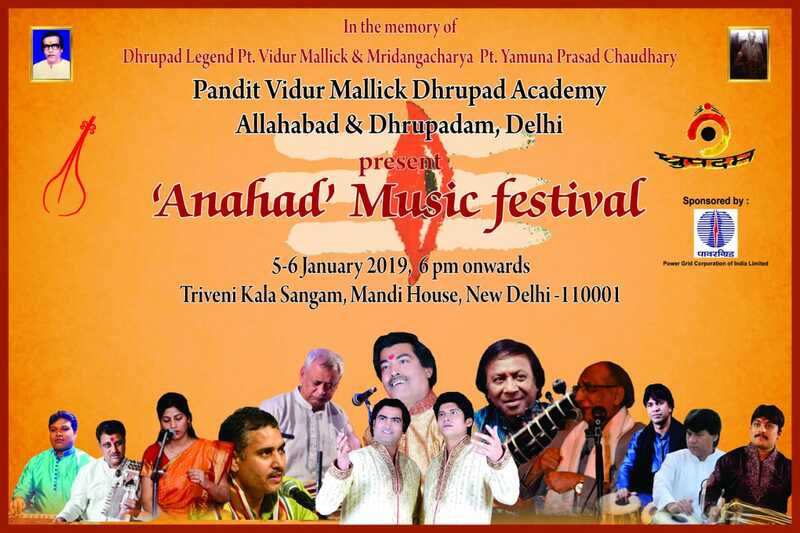 Pandit Vidur Mallick Dhrupad Academy and Dhrupadam brings Delhi's prominent music festival 'ANAHAD' featuring some of the legends & few brilliant young musicians of Indian Classical Music in the opening week of the New Year 2019. #Block Your Dates 5th & 6th January, 2019. This year we have Ustad Shahid Parvez Khan, Pandit Prem Kumar Mallick, Ustad Iqbal Ahmed Khan, Pandit Anil Chaudhary, Pt. Brij Bhushan Goswami, Smt. Priyanka Mallick Pandey Pt. Mithilesh jha, Sh. Gaurav Upadhayay, Sh. Babar Latif Khan, Sh. Zakir Dhol Puri, Sh. Ghanshyam Sisodia. Mallick Brothers will provide vocal support with their father and Guru Pandit Prem Kumar Mallick ji. 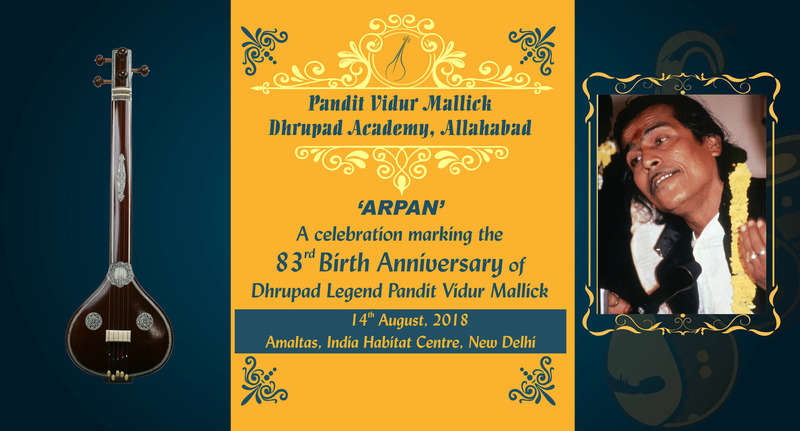 ARPAN' - A Celebration marking the 83rd Birth Anniversary of Dhrupad legend Pandit Vidur Mallick. Few eminent musicians will be going to give their performances on this special day celebrating the grand 83rd Birth Anniversary of Dhrupad legend Pandit Vidur Mallick. All music lovers, students and Artist fraternity are most welcome to the programme. Venue : Amaltas Auditorium, India Habitat Centre, New Delhi. Pandit Vidur Mallick Dhrupad Academy, Allahabad and World Integrity Centre India (WIC), Dehradun is jointly Organizing two day Indian Classical music festival in the beautiful capital city of Uttarakhand on 30th-31st March, 2018. This is the fourth consecutive year the Dhrupad Academy will be having Indian classical music festival at WIC India, Dehradun, an amazing place full of positive energy and divine aura. Some of the India's great musicians will be paying their musical tribute to the Dhrupad legend Pt. Vidur Mallick ji. The two day music festival is being supported by The Maharana of Mewar Charitable Foundation, Udaipur along with the Sangeet Natak Akademi, New Delhi. 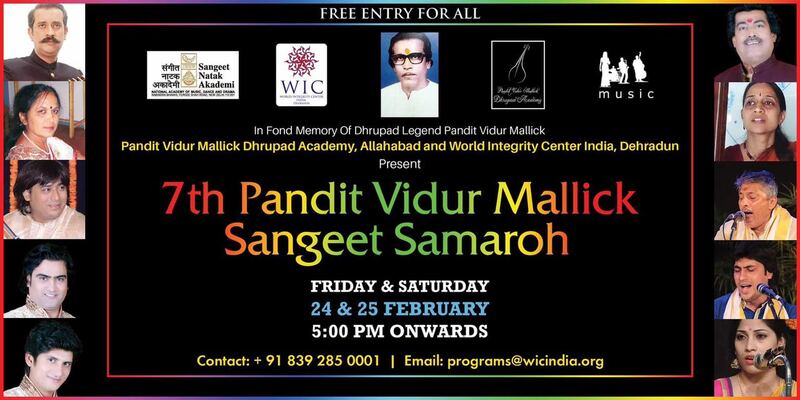 A grand two-days Indian Classical music festival at Dehradun in the memory of Dhrupad Samrat Pandit Vidur Mallick of Darbhanga Gharana featuring Eminent Vocal & Instrumental musicians of India Organized by Pandit Vidur Mallick Dhrupad Academy, Allahabad - India and World Integrity Centre (WIC), Dehradun supported by Sangeet Natak Akademi, New Delhi. Please share this information on your wall so that all those who love DHRUPAD music can join us at the festival and lets pass on the message to the music lovers across. 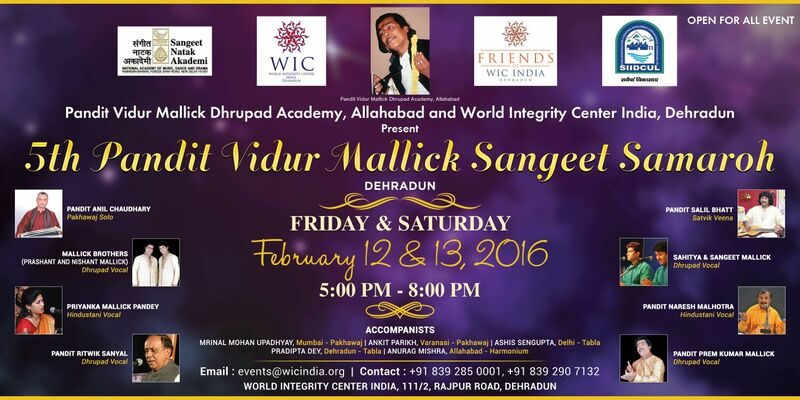 Looking forward to a big number of allied audience at World Integrity Centre (WIC), Dehradun soon. Dehradun is known for its natural resources, publishing services and particularly for its prestigious educational institutions & Cultural activities. Please Join us - Admission open - ENTRY FREE! !